After the Australian Grand Prix Ferrari had done 2500 miles of testing but after qualifying in Brazil the gap between the team and McLaren was still there. Worse still Michael Schumacher was outqualified by the Stewart-Ford of Rubens Barrichello as well. But if things at Ferrari were not happy, it was a lot better than at British American Racing where on Friday Jacques Villeneuve stormed off to his hotel, fed up with mechanical troubles and missing his own BAT-sponsored birthday celebrations. On Saturday Ricardo Zonta crashed heavily when something broke and he was carted off to hospital with a gashed leg. Villeneuve then qualified 16th only to be booted to the back of the grid because of illegal fuel. The BAR boys began to realise that F1 was rather more difficult than they had expected. 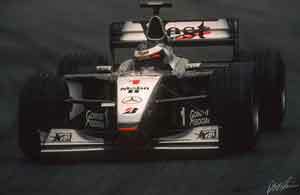 The race was to see David Coulthard's McLaren falter at the start. The car had to be pushed into the pitlane and started from there, three laps down. Hakkinen had set off looking dominant but after four laps the McLaren's gearbox faltered and he was passed by both Barrichello and Schumacher. Barrichello's lead did not last long. He had chosen a two-stop strategy and had to pit. When Barrichello stopped Schumacher's Ferrari led the race but there was no way he could keep Hakkinen behind during the pit stop sequence: the McLaren was simply too fast. Heinz-Harald Frentzen finished third for Jordan, despite breaking down on the last lap, thankfully all those behind him had been lapped. Barrichello was held up by Eddie Irvine's Ferrari after his first stop and then retired with engine failure.